As a result of a tragic automobile accident, my sister Wyndi McDonald suffered a spinal cord injury, and she was left a paraplegic and amputee. Wyndi has no feeling or use of her body from the waist down, and her amputation unfortunately left her with one leg and a partial hip. Wyndi is now faced with many physical and emotional challenges, and her accident has left her with many obstacles. Wyndi works very hard to overcome these obstacles, despite her injuries. She is very social and loves to stay active. She even aspires to renew her driver’s license and once again learn how to drive a car. This will not only help Wyndi regain some of her independence, but will allow her to return to a career and resume an active and productive life. Those who know Wyndi, will ensure that she does not let her disability get her down. Through all of her medical struggles, she remains positive and has an optimistic outlook on life. She never puts a limit on what she is capable of — the only thing holding her back from living an independent life is the expense of the equipment, specialized ramp, automobile and home modifications to do so. Wyndi and I live together in a two-story home. Wyndi’s living area is on the main floor where it is easiest for her to get in and out of the house.However, the bathrooms are on the upper level and basement, and Wyndi has limited access to the bathroom. 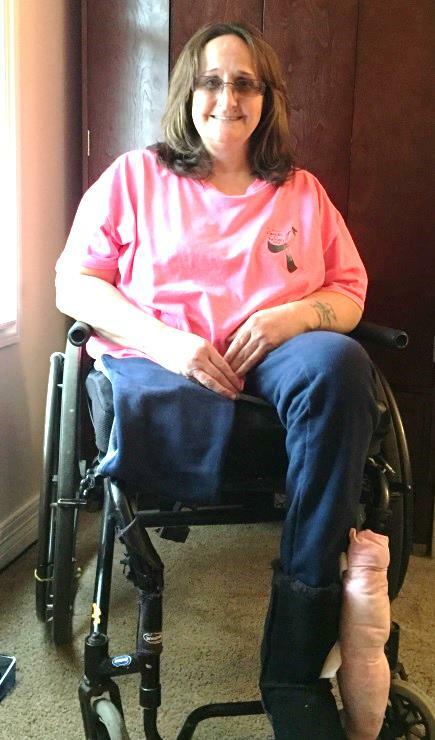 As a result, she has to shower at the local YMCA, where the hours are limited and a shower is not always available.This arrangement is less than ideal, and more than ever, Wyndi needs a specialized wheelchair lift and stair ramp installed in her home. It is very difficult to live in a place without modifications. These modifications are extremely expensive and most are not covered by healthcare. This is why she needs your help. Thanks you for any help that you can give. Praying for you sister. God has a plan for you to help others. Wyndi, where should I begin? We've seen and done it all, and through it all, you shared your love and laughter that I will cherish the rest of my life. You are an AMAZING young lady that deserves nothing but the best! I adore you and you are forever in my thoughts and prayers...I love you! Wyndi is one of the best people that I know. Her enthusiasm for life is far greater than anyone I have ever met and her mere presence will always leave you smiling. Being able to call her my friend is one of life's rewards. Luv u Wyndi....everything is going to work out for u....ur an awesome person!!! I have always loved your up beat and honesty! !though i am not able to give monetary support at this time due to my own situation...i will do my best to help u in any way i can!You deserve the best and what will help you...after all u are ALWAYS there for all of us!I love you!! Loving you forever and ever!!! My sister from another Mister!! !